I'm pretty sure I wasn't thinking straight when I made it so that Mom stays off the phone the whole time and just stands there while Ninten jabbers off to Dad. 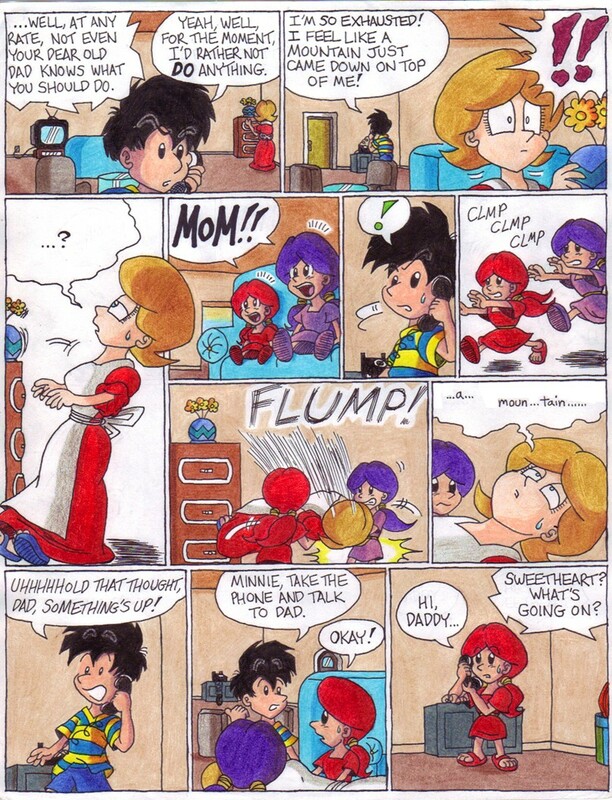 After what the family just went through, she should have shoved Ninten off the phone the moment she became aware of who was on the other line. What kind of mother is she? I had been looking forward to drawing that final panel for a long time, and I'm pleased to say that the tense, insane look on George's face turned out looking more-or-less exactly how I had pictured it in my head. In Mother 3, there's a huge mess revolving around the "Dragon of Darkness", but even at the end of the game, we never get to see him/her/it. Well, we do get to see a huge black "breathing" mass which MIGHT be the Dragon (in the shot with all those tornadoes, I believe), but that's unclear. Well, one evening about two weeks or so ago, I discovered the rare Evanescence song "Before The Dawn", and when I heard it, I felt it would fit perfectly with the destruction of the world at the end of Mother 3. And then, this breathtaking image just flew into my mind. I saw the Dragon (I had no clear idea what I wanted it to look like, albeit I knew I wanted it slender and very nocturnal-looking) standing atop the ending world, staring at a crescent moon as though it could reach out and grasp it.